In 2005, Cardinal Ratzinger became Pope Benedict XVI. Five years later, on the pope’s first official visit to the United Kingdom, his first stop was Glasgow, Scotland, where he celebrated the opening Mass to a newly composed setting by the Scottish composer James MacMillan. That Mass setting was also sung a few days later when Pope Benedict presided over the beatification of John Henry Newman in Birmingham. The choice of MacMillan to compose this work was fitting in many ways. Not only is he one of the most honored and prolific living composers of sacred choral music (as well as instrumental works; his Fourth Symphony was premiered in a BBC Proms concert last summer), but he is also a devout and theologically alert Roman Catholic, and (perhaps most importantly) an active church musician. Since 2005, he has been choirmaster at St. Columba’s Church in Glasgow, for whose masses he has composed a large body of music. While his work is frequently performed in concert and on recording, much of his choral repertoire is deliberately liturgical in construction. MacMillan’s works for choir often exhibit the fundamental role of plainchant for his composition. Consider Miserere (2009), a complex a cappella setting of Psalm 51 for eight parts. The music is sometimes tormented, sometimes achingly beautiful, at the last quietly triumphant. In the middle of the piece, the choir sings, in a slow, lilting, triple meter, Asperges me hyssopo, et mudabor: lavabis me, et super nivem dealbabor — “Thou shalt purge me with hyssop, and I shall be clean; thou shalt wash me, and I shall be whiter than snow.” The harmonies are simple and the melodic line slowly descends as the dynamics move from a confident fortissimo to a soft mezzopiano on the final but unresolved chord (one of those aching moments). After a brief silence, the four lower voices — reminiscent here of Russian chant — sing: “Thou shalt make me hear of joy and gladness; that the bones which thou hast broken may rejoice.” This is echoed antiphonally by the upper voices, again in a four-part chant: “Turn thy face from my sins; and put out all my misdeeds.” The pattern is repeated with the next two verses of the psalm. The effect is riveting, largely because of the simple clarity of the chant that defines the melodic line. 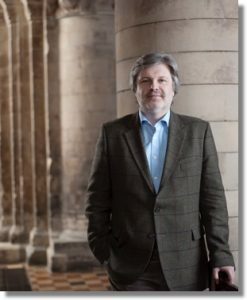 MacMillan has invited the Strathclyde University Chamber Choir to sing in services at his parish a few times a year, and has written a series of Communion motets for them (currently numbering fourteen), now collected as the Strathclyde Motets. Most are Latin settings of the propers for Communion. One of the English language motets — and apparently the most popular with choirs — is O Radiant Dawn, a setting of one of the “O Antiphons” for the last week of Advent. Also notable are the triumphant Data est mihi (“[All power] is given to me”) for the feast of the Ascension, and the pensive Mitte manum tuam (“Stretch forth your hand”) for the second Sunday of Easter. This last work is a good example of the influence of Celtic folk music (including his use of the rhythmic device known as the “Scottish snap”) on MacMillan’s use of ornamentation. While the dead-end culture of modernity has culminated in the celebration of inanity, self-indulgence, even death, the Church — if she rediscovers herself — can bear witness, verbally and musically, to the transformative presence of the Logos. I’m grateful that James MacMillan is committed to nurturing such rediscovery.